Onondaga Audubon’s Derby Hill Bird Observatory, located on the southeastern corner of Lake Ontario in Oswego County, NY, is one of the premier hawk watches in the Northeastern United States. Hawk counts at the site were started in the early 1970s and since 1979 have been conducted every year in a standardized way. On average 40,000 raptors are counted each spring as they migrate northwards, making this site one of the best spring sites in the country. Hawks, eagles and vultures are the main attraction at Derby Hill, but impressive numbers of Snow Geese, Red-winged Blackbirds, Common Grackles, Blue Jays and Baltimore Orioles can also be seen migrating here. After a warm night with south winds in early May, the hedges on the hill can be packed with warblers, orioles, tanagers and thrashers, as these birds pile up on the south shore of Lake Ontario. The hawk watch season runs from the beginning of March until the end of May, when the bulk of migrating raptors can be expected. 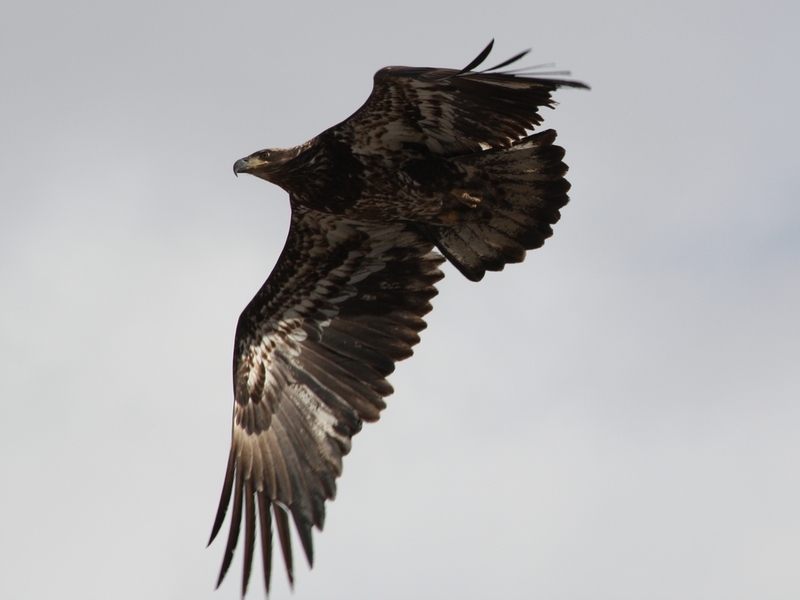 Outside this period, favorable weather systems in February can trigger early movements of Rough-legged and Red-tailed Hawks and Golden Eagles, while immature Bald Eagles and Broad-winged Hawks continue into June. April is the best month, and in late April up to 20,000 Broad-winged Hawks have be observed in a single day. In late fall, the bluffs at Derby Hill provide an excellent site for lake watches, which each year turn up pelagic birds normally seen only at coastal sites, e.g. jaegers, rare gulls and scoters. Geography is the primary reason for the concentration of birds at Derby Hill. Thermals do not occur over water and most birds utilize thermals to save energy during migration. As birds migrate north in the spring and encounter Lake Ontario most turn east and travel along the lakeshore until they can again turn north to continue their journey. Derby Hill is located precisely at the sweet spot where birds turn the corner of the lake. Hawks are particularly adept at utilizing thermals during migration and most species of raptor are reluctant to fly over large bodies of water. These two factors in combination with the location of Derby Hill gives rise to days in the spring when thousands of hawks can be observed. There are two hawk watch lookouts, north and south, that are used depending on the wind direction. Sage Creek Marsh on the south side of the entry road also has a kiosk and a platform for watching waterfowl, herons and other wetland species. The sanctuary headquarters is located at the top of the hill on a bluff overlooking Lake Ontario. This is the location of the main (north) lookout. A series of trails also start there. The trails start at a large rock and flower garden, and then move south across fields, swamp and woodlands. There is a boardwalk through the wet area. The trails are open year round. Except possibly for the deep part of winter, December and January, Derby Hill has something to offer in all seasons. The official hawk count starts March 1 and continues through May. March starts the major raptor migration period with many species peaking between mid-March and mid-April. March also starts the tremendous movement of icterids – Red-winged Blackbirds, Common Grackles and Brown-headed Cowbirds. April starts the migration of many passerines. Being at the edge of the lake you can also watch duck migration and the many terns and gulls. May brings most of the warblers, vireos, flycatchers and other small birds. There are times when the trees lining the road and hedgerows are full of nervous energy. Summer months are not as dramatic as spring and fall but the trails are open for the local breeding bird, botany and butterfly enthusiasts. With the remarkable return of the Bald Eagle in our country, Derby Hill is an excellent place to spot these birds during their summer movements along the lakeshore. By late September and through October and sometimes into November both Parasitic and Pomarine Jaegers can be seen from the bluff. In addition many species of geese, ducks, gulls and sometimes terns make this a worthwhile visit in the fall. The sanctuary has signs directing visitors to parking and lookouts. Raptors stand, by their very nature, at the top of the food chain in their ecosystems. They serve as vital indicators of the health of these ecosystems, and it is therefore important to protect these beautiful animals. Most of them lead fairly secretive lives during the breeding season, and are only seen in large numbers at migration bottlenecks. Consistent counts over multiple years at these sites can help us unravel and understand population trends. The Bald Eagle, not too long ago a fairly rare migrant at Derby Hill, has been seen in steadily growing numbers over the years, and this increase reflects the healthy status of the Bald Eagle populations in North America. The first raptor counts at Derby Hill were carried out in the early 1960s. Since 1979, the count has been taken each spring according to a standard protocol. Derby Hill’s data have been entered into a database maintained by the Hawk Migration Association of North America (HMANA). As part of a network of hawk watches in Eastern North America, the hawk count at Derby Hill contributes to collecting valuable data on migrating raptors, that can be used as an important conservation tool. Derby Hill Bird Observatory hawk watch data can also be found at Hawkcount.